If you are looking to travel to one of the most important destinations of ecotourism in Costa Rica, Monteverde is waiting for you... This city was founded in 1950 by a few Quaker families, who migrated from the US fleeing war. They found in Costa Rica a country without an army. They found the perfect location and settled in the area now called Monteverde. They established dairy farms that will eventually supply the Monteverde Cheese Factory. Shortly after their arrival they established the wildlife sanctuary of Monteverde. This beautiful place has been mentioned in Newsweek 100 places to remember before they disappear, Monteverde appears as number 14 of America; also it has been considered as one of the Seven Wonders of Costa Rica by popular vote, and has been called by National Geographic "the jewel in the crown of cloud forest reserves." Most of the locals live off tourism, so in this area you will find a variety of hotels to suit all tastes and budgets, as well as many other tourist services such as banks, supermarkets, restaurants, shops, bars, cafes and bus stops, here you can find everything you need to spend a cozy time in the area. This is a private nature reserve, created in 1972 by scientist George Powell and Quaker Wilford Guindon. It is a private protected area of great scientific and economic value, which is certainly a positive example of conservation both nationally and internationally. This has served as a living laboratory for hundreds of scientific studies and mainly destined for many foreign visitors, making the development of ecotourism in the Monteverde area possible. This is a protected wildlife area; for this reason the reserve has a management plan, and technical planning tool that directs the actions to take, so that the area will continue to reach their conservation objectives. This reserve is open daily from 7:00 to 16:00 hours all the year and from 18:00 to 20:30 hours, only for evening walks properly booked in advance. 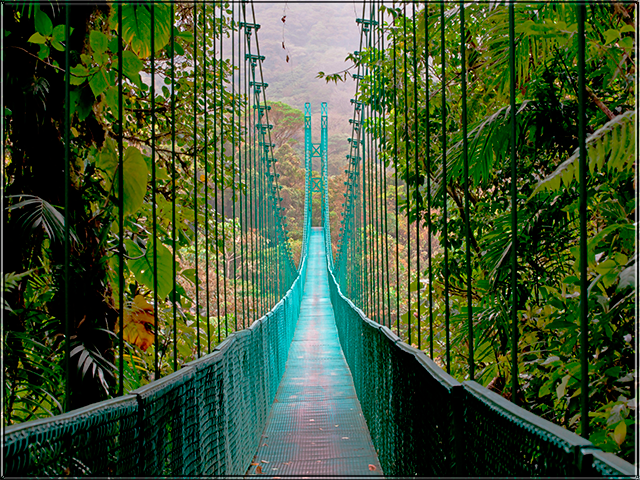 The main attraction of the Monteverde Cloud Forest Biological Reserve is its network of 13 kilometers of trails. As you walk along the paths, you can admire many wild animals. You can walk to the "La Ventana" observatory, where you can appreciate beautiful panoramas exposed naturally by the Continental Divide, which is considered a geographical feature that runs along the ridge principal of Costa Rica. Here you can experience the power of the moisture-laden trade winds coming from the Atlantic coast, and watch them descend at a high speed toward the Central Pacific and the coastal plains of northern Spain. Also we recommend visiting the suspension bridge "Wilford Guindon," where you will have the opportunity to see a large number of epiphytes (bromeliads, orchids, ferns, and mosses) and other life forms that inhabit the tops of trees native to the area. It is located on the Caribbean continental divide side. It is 1600msnm at an average height, with a climate dominated by the trade winds from the northeast, with an annual rainfall of 4000mm³, an average temperature of 18 ° C, and a relative humidity of about 100%. It is located in the living area of Lower Montane Wet Forest (Holdridge), and it is within the Bellbird Biological Corridor. The height, its geographical position, and the influence of the trade winds loaded with humidity and other factors make the Santa Elena Cloud Forest Reserve a place with rich biodiversity, abundance of epiphytic bryophytes and the undergrowth is very dense and presents great number of tree ferns and other plants such as heliconias. The most abundant family is Lauraceae, with more than 70 species in the area; meanwhile Orchids are the most diverse group with about 600 species in the area. Observing animals is a bit difficult, because the forests are very dense; the birds are the group most easily seen in the way. 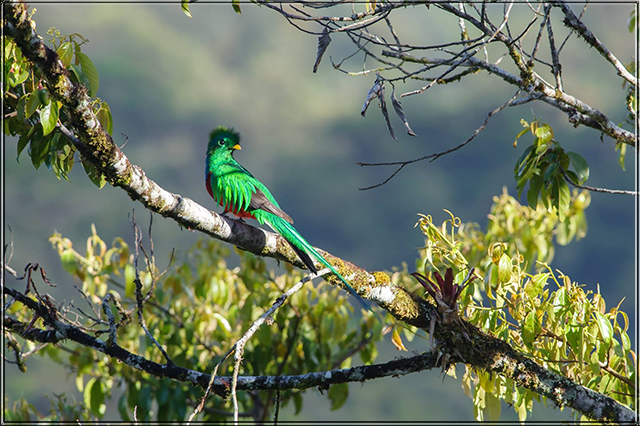 Monteverde has many attractions in this area, you can enjoy the quetzal, this famous bird living here in some seasons of the year and many mammals. You can also enjoy butterfly gardens, horseback riding, or you can visit to the Cheese Factory, very popular in the area and hummingbird galleries, over 400 species of delicate orchids adorn the branches of towering trees, their captivating colours of whites, lilacs and yellows contrast with the amazing emerald green forest. There are different ways to get to Monteverde; choose the one which best suits your needs. If you do not want to drive or take a public bus, shared transportation is the best option for you. Interbus provides shuttles door to door to Monteverde. This service is very convenient, and Interbus offers shuttles from most important tourist destinations in Costa Rica. If you want to check the routes from / to Monteverde, please access this Link. From San Jose to Monteverde, service is offered in the morning around 07:30 in the afternoon to around 14:30. To book please click here, and remember: book your ticket in advance of your trip. The Costa Rica public transportation is very safe and has a low price, so you should try to buy the ticket in advance of your trip. The company that provides the service from San José is Transmonteverde. If you are looking for adventure, you can opt for this transportation, which is provided from Arenal-Monteverde-Arenal daily. Remember to make sure that your provider has all insurance coverages and book your trip in advance.